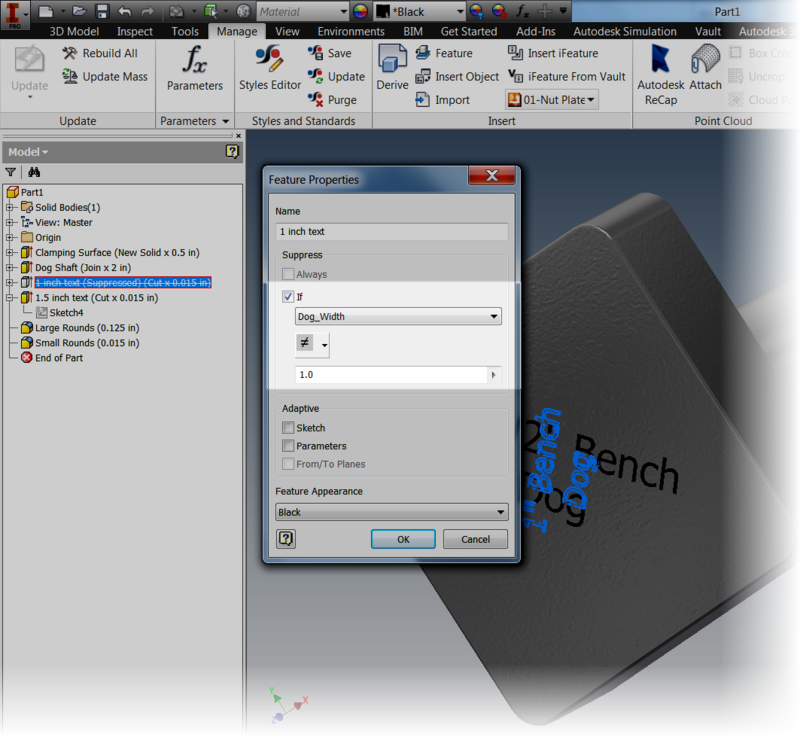 Sometimes the challenge I encounter isn't knowing which tool in Autodesk Inventor to use, but which tool is best for a given situation. For example. Not that long ago, a challenge arose. I had a part that was going to change size. 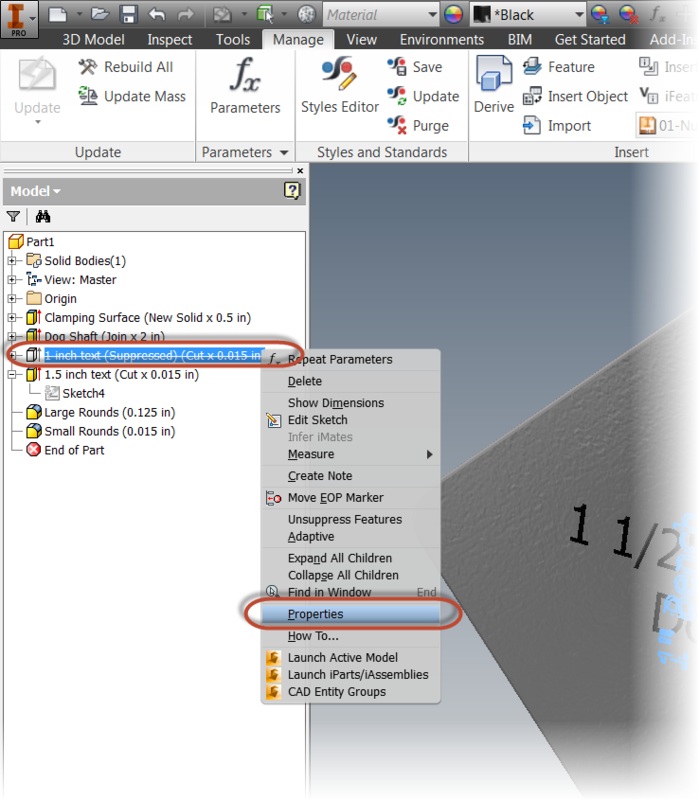 When the size of the part changed, there was text that also needed to change to reflect the changing dimension of the part. Here I have an example I've created for this blog. 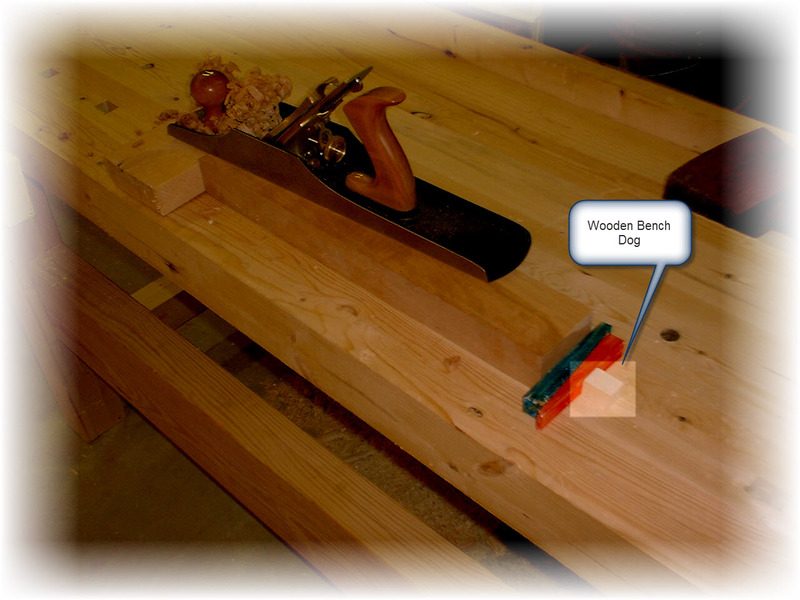 It's of a common wood working tool called a bench dog. It's a pin, often (but not always) with a square head. It slides into holes in the workbench and clamps boards from the side for working. The head has dimensions of 1 inch square, and 1.5 inches square. 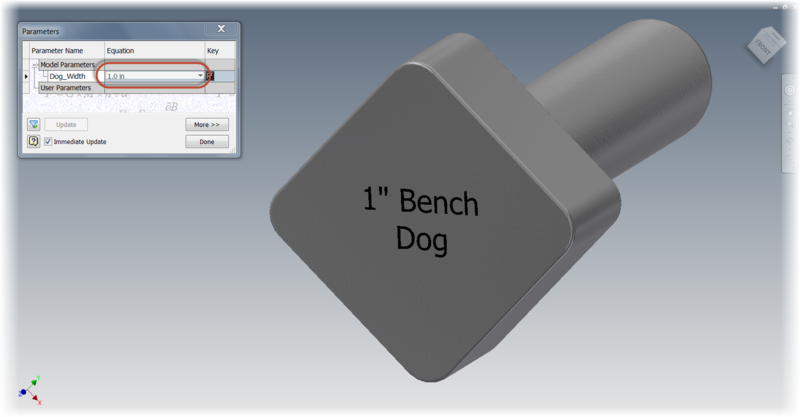 I've created text that will identify the bench dog. 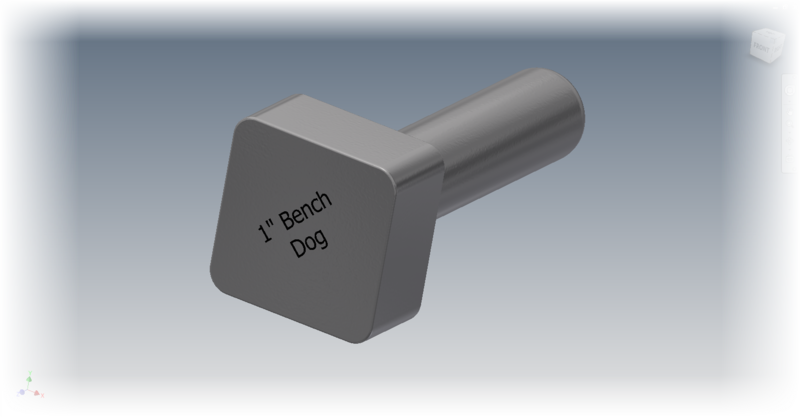 The 2 inch bench dog. Different text, with a larger height is used. Both the height of the text was going to change, and the text itself was going to change. I'm not savvy enough to get into the API and alter it using VBA. But after reading Bob Van der Donck's blog here, I found a little inspiration. Why not just create multiple features, and suppress them based on the dimension that was changing. Below is an example. Notice that the 1 inch text is suppressed. It only shows red on the part because I've selected it, and it's previewing for me. 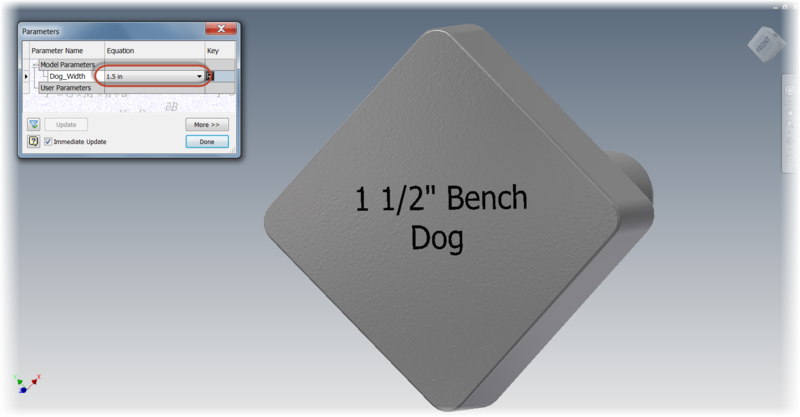 The "1 inch Bench Dog" text is suppressed. For what I was doing, it would work! But we wanted to avoid iLogic, so the parts could be kept as simple as possible, and could be reproduced by someone familiar with Inventor, but not necessarily iLogic. And so the "brain-wracking" began. How can I make this happen,without iLogic. Then I had my AHA! moment. 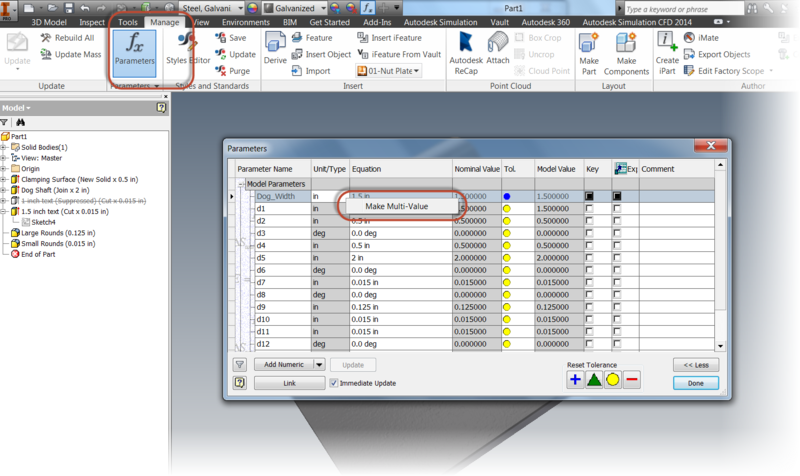 Inventor has a tool called Conditional Feature Suppression. What does Conditional Feature Suppression do? It suppresses a feature based on a dimension! It's perfect for my case. 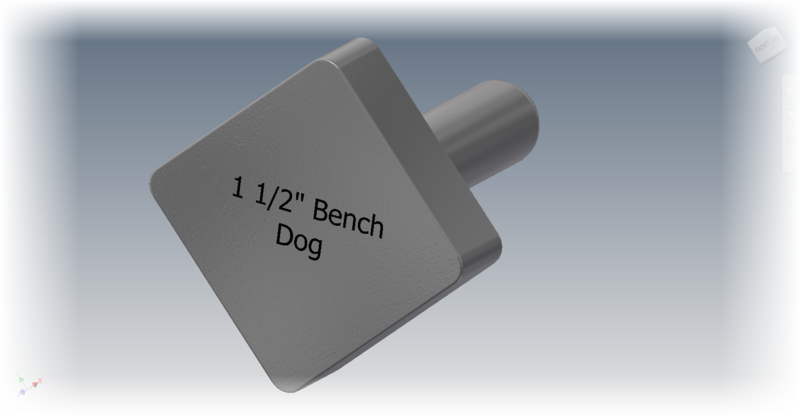 My first step, was to rename the parameter defining the head size of the bench dog to "Dog_Width". 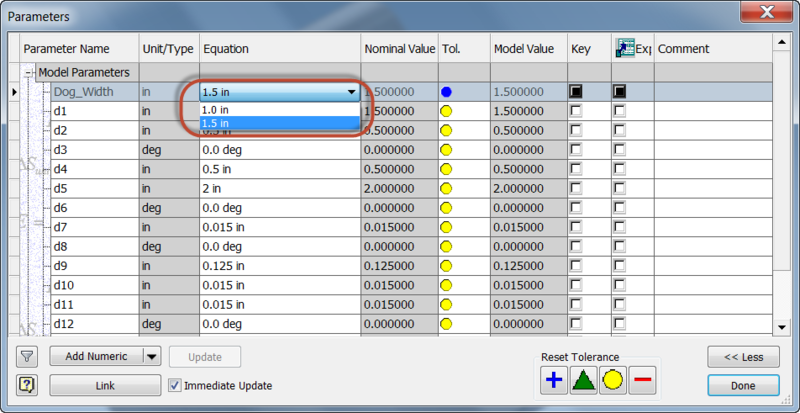 I also made this parameter a Multi-Value list with the values of 1.0 in and 1.5 in. Adding the values to create the list. With the parameters created, I located the 1.0 inch text in the browser, right clicked, and chose Properties. 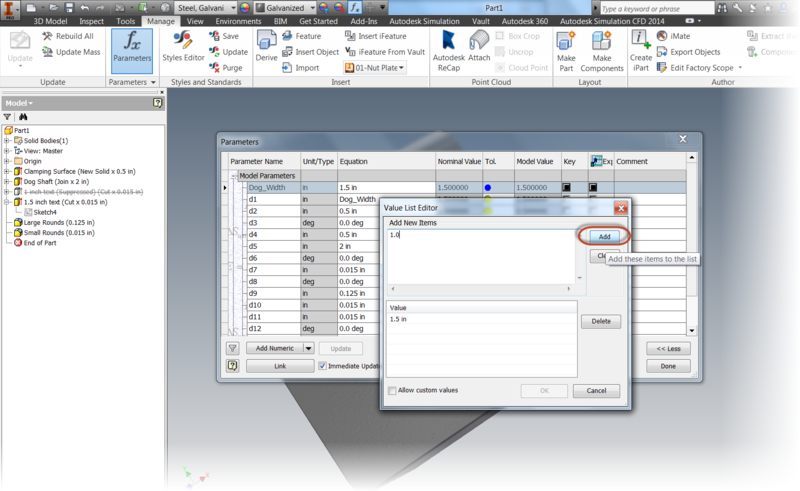 One the Properties dialog box opened, I checked the If check box, selected Dog_Width in the pull-down menu, and set the rule so the feature would suppress if the Parameter was anything other than 1 inch. The options I've selected for the 1.0 inch text. 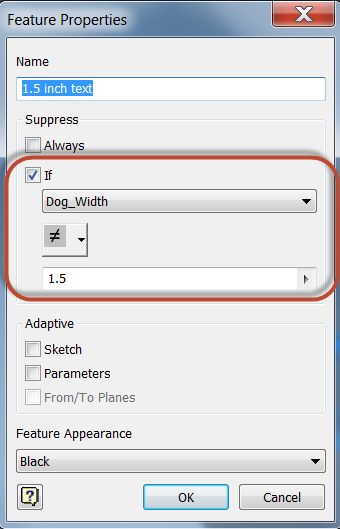 Now all I had to do was repeat the same steps for the 1.5 inch text, telling it to suppress if the Dog_Width parameter was not equal to 1.5 inches. The settings for the 1.5 inch text. And I'm done! 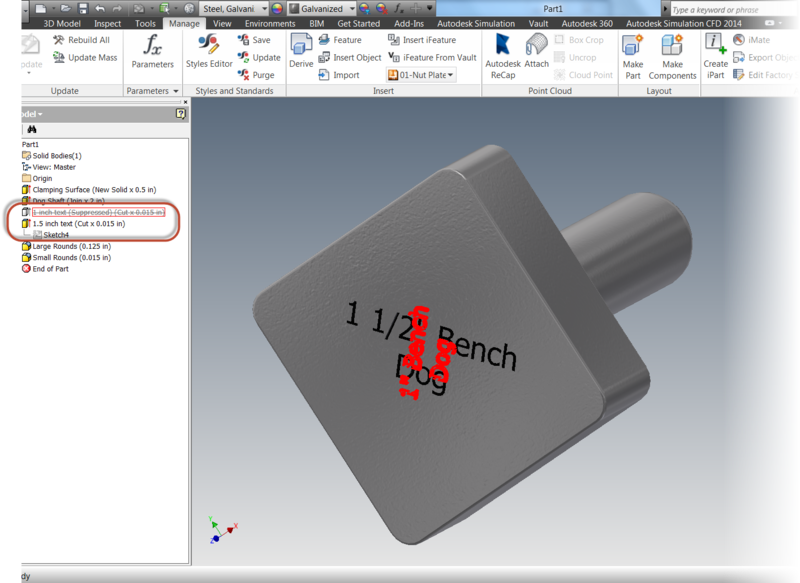 Editing the parameters and toggling between 1.0 inches and 1.5 inches will both change the size of the bench dog, and suppress and unsuppress the appropriate text! So go ahead and take a look at Conditional Feature Suppression. I know there are many out there who love iLogic, and will say that this could just as easily be accomplished with a few lines in an iLogic rule. And that's true enough. I'm not trying to say that iLogic isn't appropriate for this. But what this gives is an option. The ability to accomplish the same thing without using iLogic and sticking to tools that may be more familiar to the average user than iLogic. Hey, there's no reason this couldn't be used in conjunction with other iLogic rules! So keep this in your bag of tricks. It may prove helpful someday! And as always, check out the video version of this below!